During our Highway 1 road trip we had a great time camping in Califronia which is why I’m sharing eight of my favorite campgrounds with you. I’m also explaining how to book them at the end of this post. Maybe I shouldn’t give this away, but this is my absolute fave campground in California. 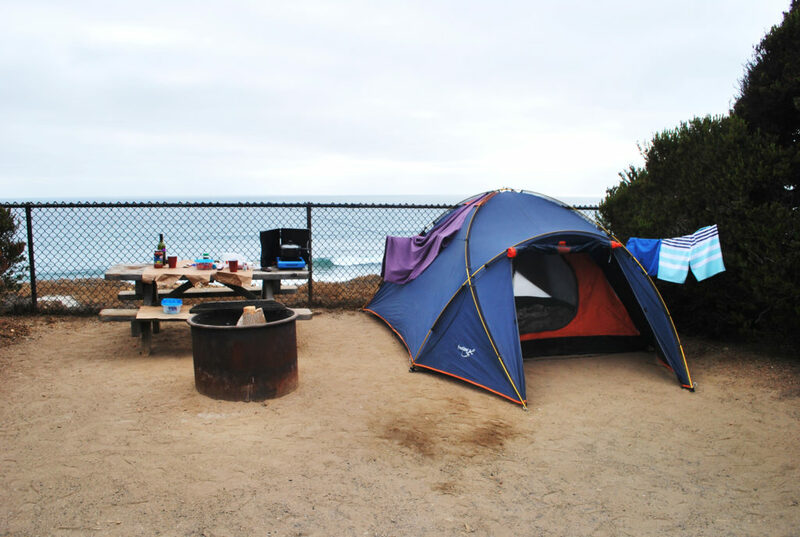 You can camp just right at the top of the cliffs, overlooking the beach with a stunning view over the Pacific Ocean. If possible go take the ocean view campsite and enjoy sleeping while hearing the waves instead of cars. 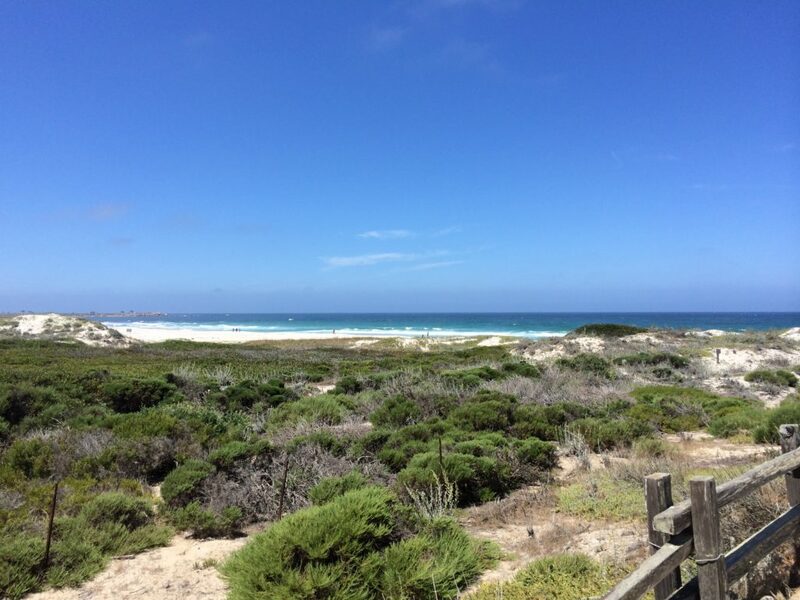 South Carlsbad State Beach is perfect for sunbathing, surfing, swimming, walking and picnicking. 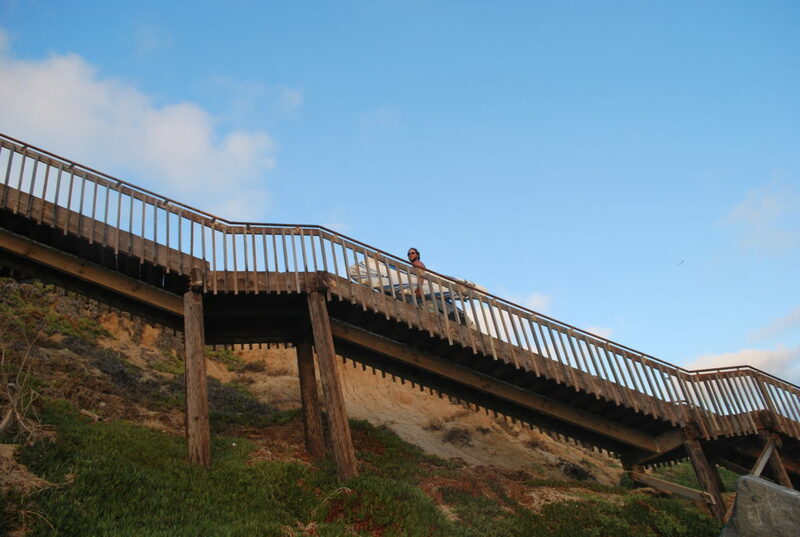 Stairs lead from the campground to the beach and it’s very popular in summer. The small camp store offers everything you need: food, sunscreen and even surfboard rental. Pssst, they also have the best guacamole ever and you really must try it! Only about 6 miles from Santa Cruz this campground is a very popular one and again, right at the beach. It has everything you need and I enjoyed our stay there, even though it was only for a night. If you have more time, then besides the beach and Santa Cruz, you can check out Monterey Pine forest. Ocean front campsites are available, you just need a bit of luck that one’s free. 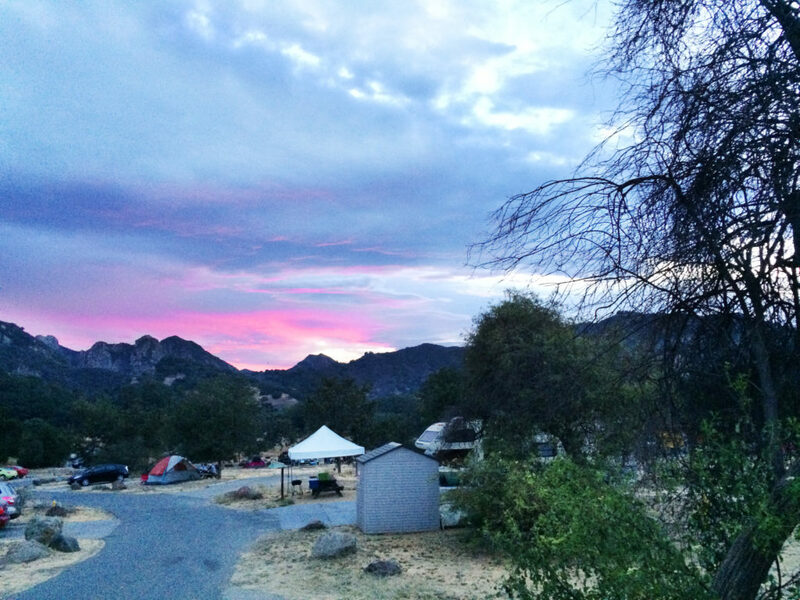 Located only 25 miles from Downtown LA and even closer to Malibu this is the perfect spot to camp when you don’t want to be right in the middle of everything but still close enough to have all the opportunities. Also if you only have a tent (not a RV) then this is the best Los Angeles camping option. From the Malibu Creek State Park you can hike Malibu’s mountains and canyons as well as experience the beaches and the city easily. 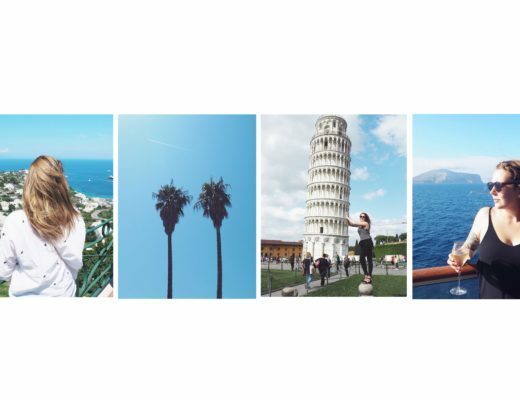 You basically can do everything from hiking in the Santa Monica Mountains, biking, rock climbing, horseback riding or kayaking. I have to admit that it isn’t the prettiest campground and I wouldn’t stay longer then one or two nights, but if you’re on a road trip and want to sleep at a cool place right at the beach that one’s for you. The camp sites kind of look like parking lots and on most of the spots you don’t get much privacy to your neighbors but you’ll be along the beach and close to the city. We didn’t spent much time here as we arrived in the evening and then only had a quick dinner and drink at the beach enjoying the sunset and after a quick morning run the next day, we were off again. And for that, it was perfect. 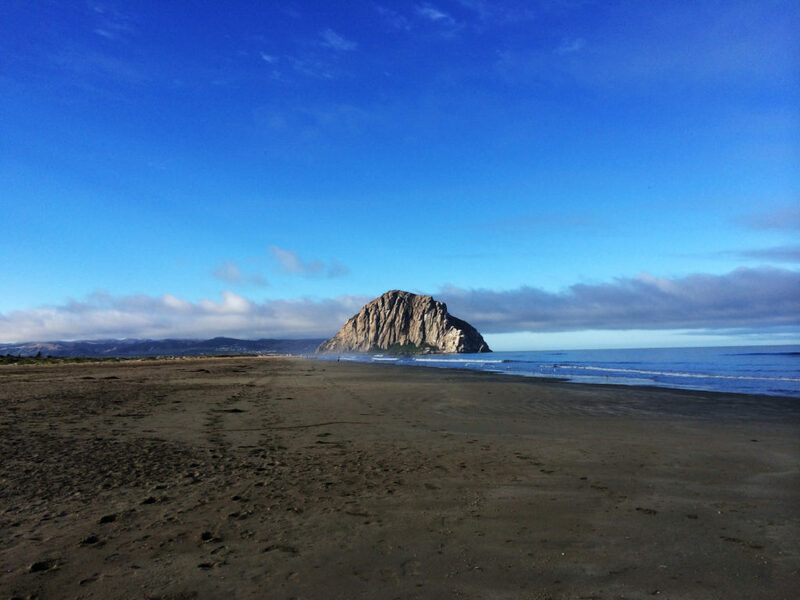 If you want a little more comfort and don’t mind not being that close to the beach, camping at Morro Bay State Park is much nicer and has showers as well. As we drove up they didn’t had a free spot unfortunately. 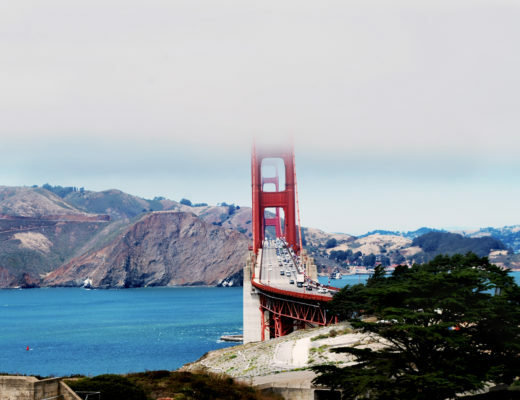 We were desperately looking for an affordable hotel or airbnb in San Francisco but everything seemed booked or just too messy, which is why we decided to drive 34 miles north of the Golden Gate Bridge and stay at the San Francisco North / Petaluma KOA campground. 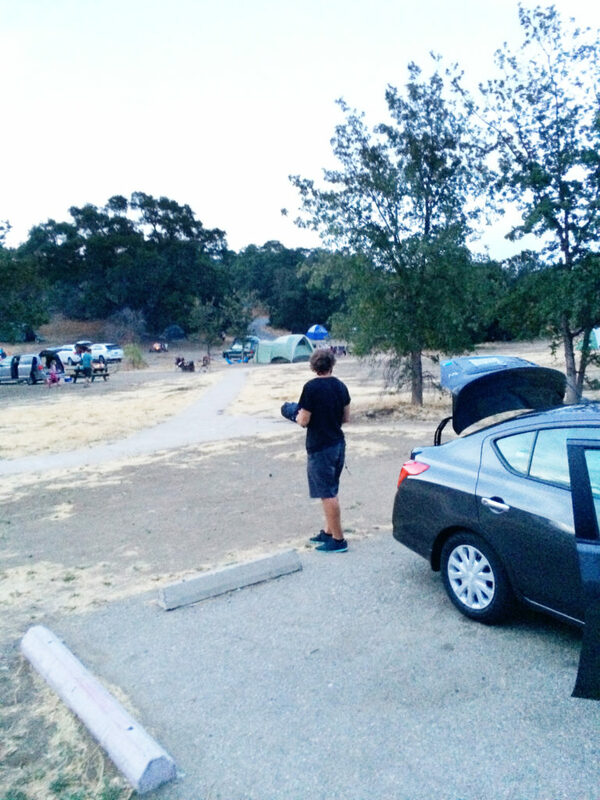 Of course if you want to have a night out in San Francisco this won’t work for you, but if not and if you might be interested in having a little stop at Wine Country, I highly recommend the KOA campground. It has wifi, a pool and a hot tub with occasional outdoor cinema, a snack bar, camping kitchen and a very good laundry facility. They also have lots of stuff going on for kids, if you’re a family on a road trip this might be ideal for you. 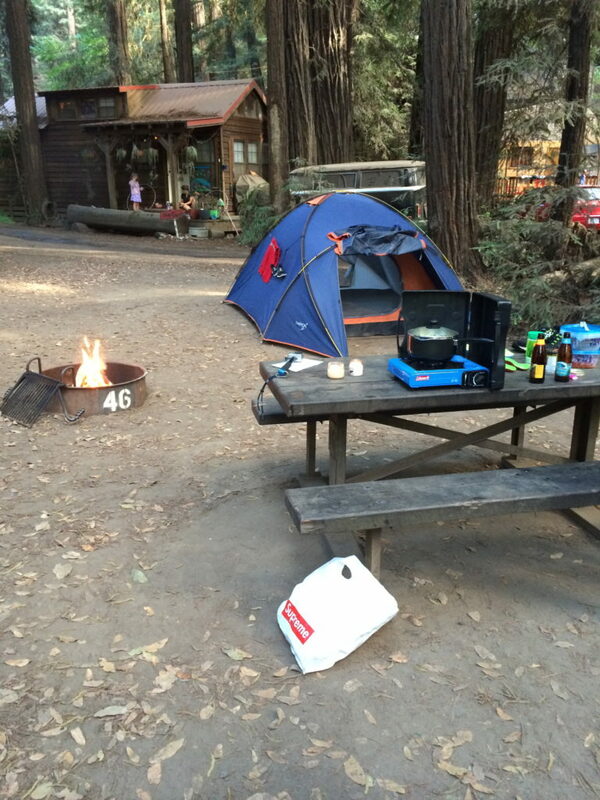 There are two amazing campgrounds in this city: San Clemente State Beach camping and San Mateo Campground. Most people probably prefer San Clemente State Bech because it’s obviously closer to the beach, but both campgrounds have great tent sites and we had a good time on both. There are fire pits and picnic tables on the sites. San Clemente is a cool small city with lots of surfing going on and you shouldn’t miss it on your California road trip. 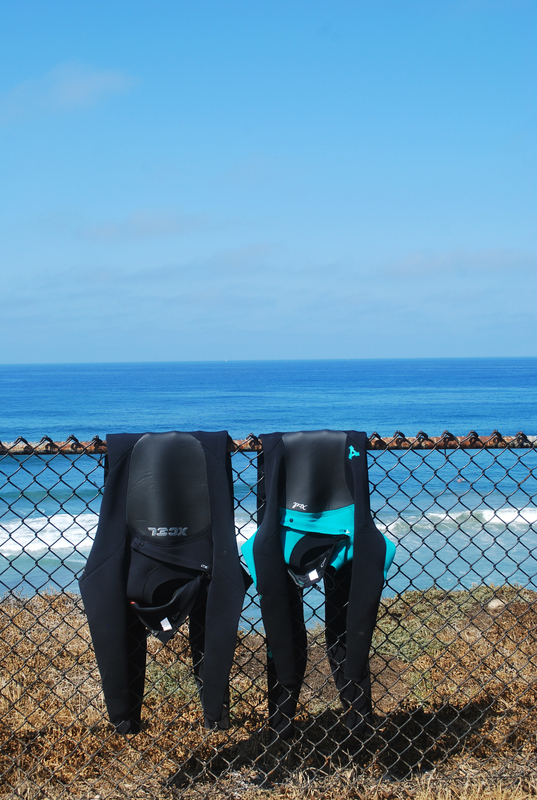 If you’re into surfing then you can take the 1,5 mile Nature Trail that connects San Mateo campground to Trestles Beach, which is a world class surfing site. While driving the Pacific Coast Highway we camped somewhere along Big Sur. I unfortunately don’t remember exactly what the campground was called that we ended up, but there are loads. 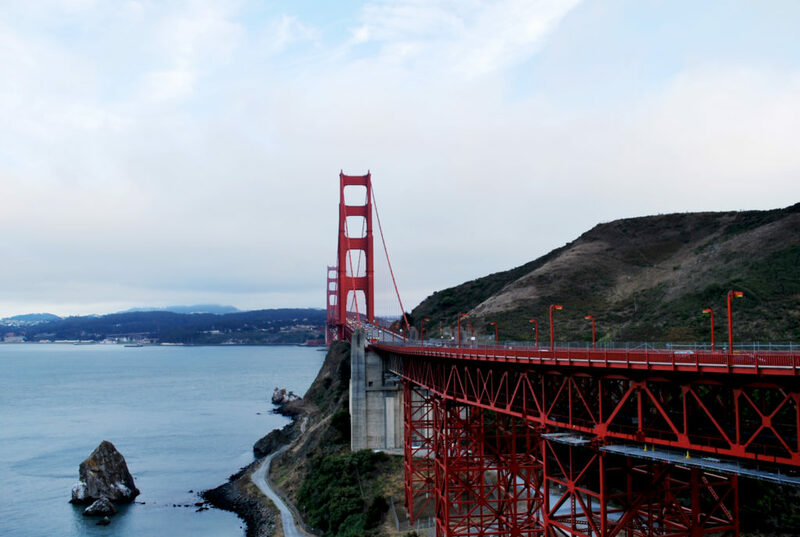 If you just drive along Highway 1 they come up on the side of the road and just to name a few, there are: Big Sur Campgrounds and Cabins, Riverside Campground & Cabins, Pfeiffer Big Sur State Park Camping or Ventana Campgrounds. Most of them are located in the woods which is really nice and you get shadow on your camping site for once. 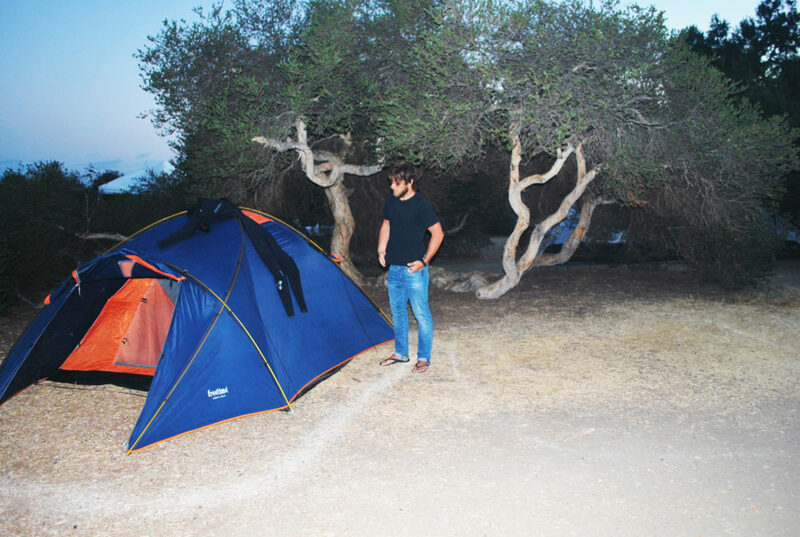 Camp stores and laundry facilities are available in most of them and some even provide wifi. This campground had to be included as it was the most adventurous. Camp 4 is located near the Yosemite Falls, on the north side of the valley and became famous as a hang out for rock climbers. You can’t make a reservation for this campground, it’s first come first serve, so be early. There are rules regarding the bears and you just have to follow them for your own safety. It starts with locking the car and using the bear lockers for food on the campsite. 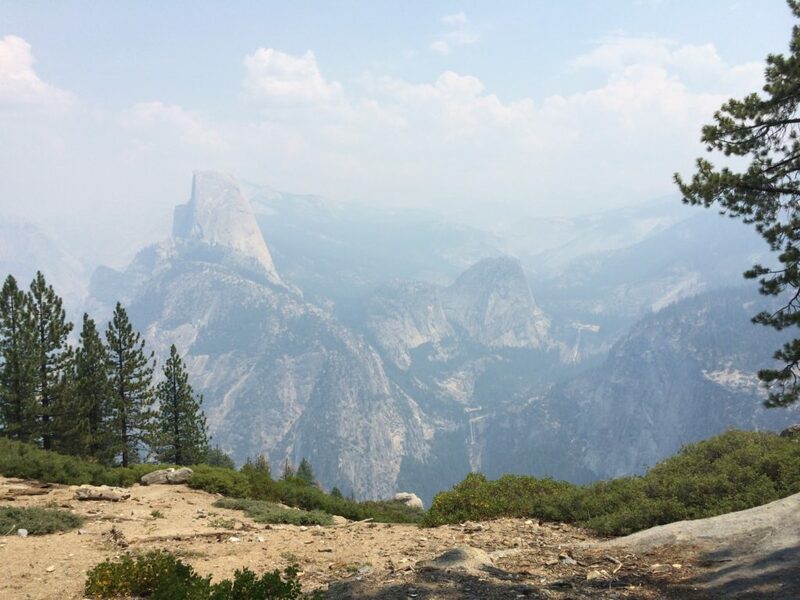 Each campsite in Yosemite’s Camp 4 contains a fire pit, picnic table and four shared food lockers. Showers and groceries can only be found nearby in the Valley but there’s a bathroom with drinking water and flush toilets right on the campground. Reservations for all the national campgrounds are available at anytime online through www.parks.ca.gov, or by calling the ReserveAmerica center at (800) 444-7275 during select hours. 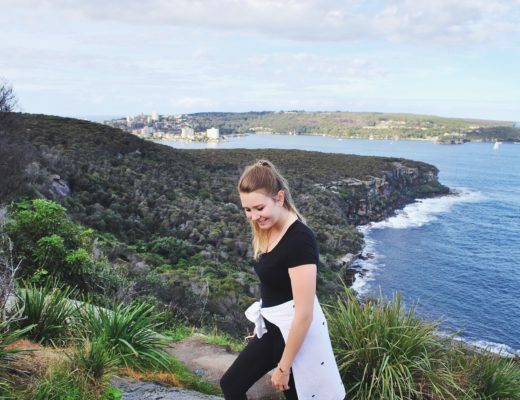 As many campsites, especially those overlooking the ocean, fill up quickly you should book up to five months ahead of your trip. However as doing this upfront isn’t always possible on a roadtrip, you just hope for cancellations. The booking website gets updated and you find spots for a few nights, even during peak season. So just check it daily. And then there are last-minute cancellations or people just not showing up. You won’t find these campsites online as they will be handled as first come first serve walk-up sites. Occasionally there are cancellations that allow first come first serve sites to be available. If you want to check these out and get one of these, you must be physically present at the entrance kiosk. How this worked for us? I would recommend to be there early, like really early if you actually are in need of a place to sleep. Google at which time the entrance kiosk opens and then be there like two or even three hours early. Most of the time you won’t be the only one waiting to get a spot. The ranger will tell everyone how many sites are available and will give those away to the first ones in line. And sometimes they create a waiting list after that, if there’s a chance that more spots are available as people are not showing. If so, get your name on the list and keep your fingers crossed. One last tip for you: If you’re camping in California and pull up in the evening or night (basically anytime after the entrance kiosk is closed) you can go check if there is a spot available and put your tent up if you find one. You then just pay at the fee collecting box at the entry (iron ranger). 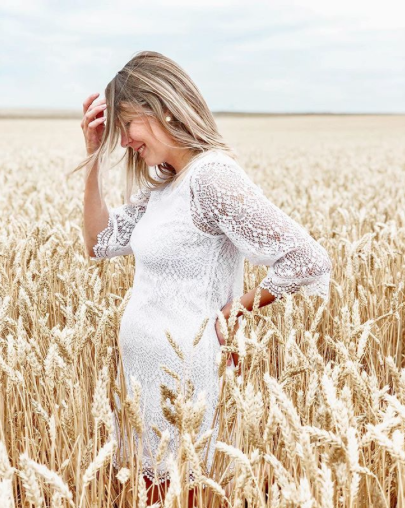 Why are some spots empty? Spots can’t be given away if they’re not cancelled, which means they stay reserved in case someone shows up. If they don’t, then they give the spot away the next day.